Denny Hulme had an unusual and difficult route in to Formula One. As one of the more down-to-earth drivers he shied away from attention and the press, but quietly went about making his headlines on the track; earning the nickname 'The Bear' for his brusque exterior. With his father having returned from World War II to start a small farm and trucking business on New Zealand's North Island, Hulme learned to drive one of the trucks and could do so unsupervised by the age of six. He left school at 17 to work for his father's business as a mechanic and a driver, but the time alone left him dreaming of being a racing driver. His work earned him enough money to buy an MGTF, and Hulme started competing in hill climbs in 1956. Soon he was taking to circuits, and three years later he was driving an F2 Cooper in which he became the joint winner of the 'Driver to Europe' scholarship. He headed to London with the other winner George Lawton, and were helped to establish themselves by Bruce McLaren. Tragically, Lawton was killed during an F2 race at Roskilde in Denmark when his car overturned after hitting a bank, with Hulme following. Devastated by his compatriot's death, Hulme grew closer to Jack Brabham, and became a mechanic for his team in order to help fund his career. The work for Brabham also allowed him to drive some of his cars, winning seven Formula Junior races in 1963, before finishing second to his team-mate and boss in the F2 championship the following year as Brabham dominated. Hulme was rewarded with some non-championship Formula One races, before finally making his championship debut at Monaco in 1965, finishing eighth. His first points came in his next race in France, as he finished fourth within 20 seconds of a podium. He also scored with fifth place at Zandvoort on his only other finish of the season. A full season followed in 1966, as Hulme impressed by finishing on the podium in all four races he finished (he retired from the other five, with only the torrential conditions in Spa which caught out seven drivers on the first lap being down to driver error). It was enough to see him finish fourth in the championship as his boss took the title. The following year, Hulme found the two ingredients that had so far been missing in Formula One: victories and consistency. His first race win came in the second race of the season at Monaco, but was overshadowed by the death of Lorenzo Bandini who was running second behind him at the time. He only retired twice all season, and added to that win with another at the Nurburgring. 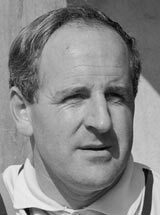 Aside from a fourth place at the season-opening South African Grand Prix, Hulme finished on the podium at every race he finished, and was crowned world champion ahead of Brabham. Having joined forces with McLaren in the Can-Am series in 1966, Hulme moved across to join his countryman's Formula One team after winning the title. His first season started slowly, but the car improved and after back-to-back victories in Italy and Canada he was joint leader of the championship with Graham Hill. Jackie Stewart and Jacky Ickx were also in contention, and at the penultimate round at Watkins Glen, Hulme crashed out while Stewart won from Hill. His suspension failed at the final round in Mexico and he was forced to settle for third. While he won the Can-Am championship in 1968 and 1970, his F1 career started to decline as McLaren dropped off the pace. Only one win followed in 1969, before his close friend and team owner Bruce McLaren was killed in Can-Am testing a year later. Hulme also sustained burns to his hands in practice for the Indianapolis 500, and ended a tough season in fourth place in the championship. 1971 was even worse results-wise, as Hulme didn't even make the podium. The situation improved in 1972 as he was joined by his good friend Peter Revson at McLaren, and won at Kyalami. Strangely, it wasn't until a year later that Hulme finally took a pole position - his only one also coming in South Africa. Revson outscored him that season though, before leaving for Shadow. While he was disappointed at the time, worse was to follow. Revson crashed in testing in South Africa in 1974 and despite Hulme's efforts to pull him from the wreckage he died. It proved to be the final straw for Hulme, he subsequently announced he would retire from F1 at the end of the season. Racing would still be a past-time for Hulme though, as he returned to drive in touring cars in Australia in the late 80's. One such race, the Bathurst 1000 in 1992, would be his last. Having complained of blurred vision in wet conditions over the radio, Hulme's car was seen running off track along the Conrod Straight, but being brought to a relatively controlled stop. What appeared to be a mechanical failure was actually a heart attack, as 'The Bear', like many of his racing friends, died on track. As a hard-working man of few crashes, Hulme's consistency brought him numerous strong results, though he was rarely one of the quickest drivers on the grid as evidenced by one pole position in 112 races. While never distracted by the fame surrounding Formula One, his desire not to embrace it meant it was difficult for many to warm to him. Beating his team-mate and boss Jack Brabham to the 1967 world championship by taking third place in Mexico. Seeing his close friend Peter Revson die during testing at Kyalami, an experience that finally caused him to retire from the sport after he had also been heavily affected by the deaths of Bruce McLaren and George Lawson. "Jack and Denny and didn't talk much at the best of times, but in 1967 what used to be extraordinarily limited conversation became almost non-existent!" - Chris Amon on the reserved nature of Brabham and Hulme. "Bruce [McLaren] used to like meeting people. He managed to cope, even when they were asking the most ridiculous questions, whereas my natural reaction was to think 'What a bunch of idiots we've got here', and either tell them so or not talk to them at all." Hulme is the world champion with the least career pole positions to his name, with his only one coming during his penultimate season. He became the first world champion to die of natural causes, a heart attack killing him at the wheel of a BMW M3.